I am so delighted to have had the opportunity to meet with the team at Arran Street East and to discover the genius behind their brand. When I came across their products I was captivated by the story at first, and then by the clear thought process that runs through the whole business. It seems like nothing has been left to chance, everything is carefully considered and on point. They are productive, current and right-now. In a world where image is everything, Arran Street East have created an image for themselves and a product that backs it up. I am entirely smitten and caught up in their magic. I was honoured to meet Creative Director, Laura Magahy, who insists on bestowing the honour on the crafters who realise the vision of her imagination. 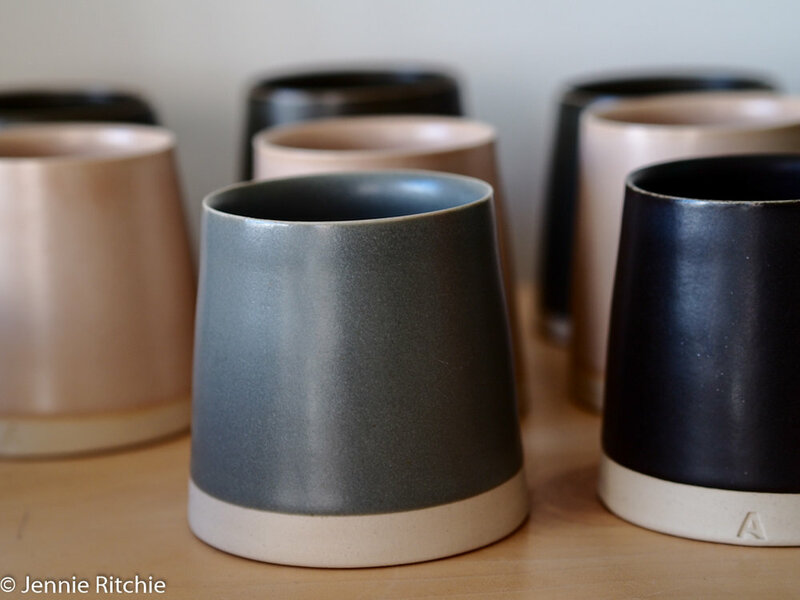 - Arran Street East Designs began from a search for simply designed pots in great colours. Is design something that you had studied or why did this search come about? For 20 years, Laura Magahy, Arran Street East creative director, has been involved in the architecture and design sector in Ireland, overseeing the development of some of the most culturally important developments of the past few years. She’s an honorary member of the RIAI, and previous chair of the Design and Craft Council, and Irish Design 2015. This experience at the cutting edge of architectural development has helped to inform the Arran Street East aesthetic. 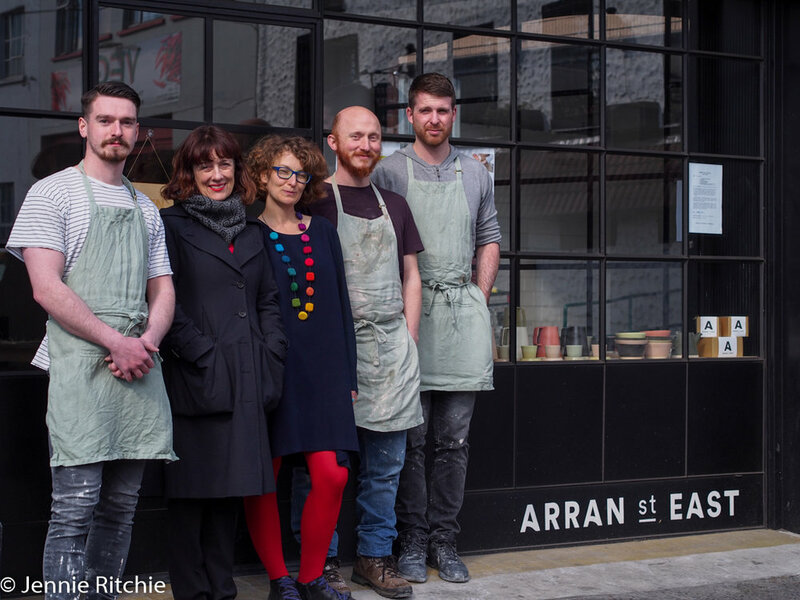 Frustrated at not being able to find the kind of handthrown, Irish-made stoneware she wanted to own, she decided to learn to throw, and Arran Street East was born. - The business is set in Dublin’s Victorian Fruit and Vegetable Market. Is this an area that you are originally from or where did you grow up? Laura has worked in the Capel Street area for years, and has a great love of the vibrancy and beauty of the markets area, so when the opportunity to set up a studio and shop right opposite the market, we couldn’t refuse. - From a seedling of an idea to the sale of the first product, how long did the initial process take? Was it a difficult journey or a process that you enjoyed? Arran Street East officially launched in late 2014, and since then has gone from strength to strength, gathering customers and media attention around the world. It has been a thoroughly rewarding journey, there have of course been challenges along the way, but on the whole it continues to be an inspiring process to be part of. - The design of your signature range The Pots is wonderfully thoughtful - inward to keep tea hot and outward to allow coffee to cool. I love the simplicity of the design within this concept. Where did you draw the inspiration from? 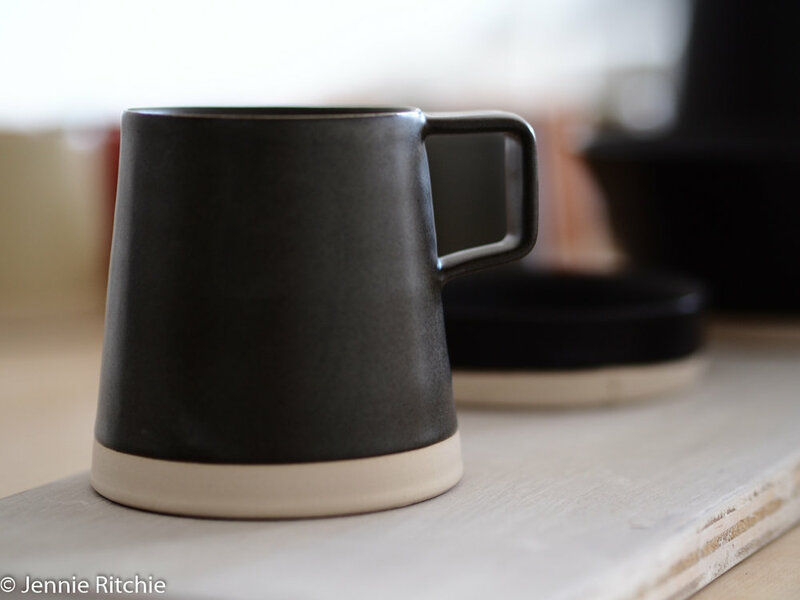 We think of ourselves as architects in clay, and the tessellating shapes of our pots and mugs are a cornerstone of our identity. Our inspiration is drawn from the city around us, in the shapes and the colours. We also know that everyone has different preferences when it comes to how hot their tea or coffee is, our in and out shapes solve that: the out shape allows you to drink at a cooler temperature; while the in shape keeps it warmer for 20% longer. - You have brought your location in the Fruit and Vegetable Market home to your designs, calling the colour options cabbage, potato, parsnip, lemon, pomegranate and pink grapefruit. How important are your surroundings to the design ethos and the process? The Victorian Fruit and Vegetable Market of Dublin, where our studio and shop are based, is a big inspiration for us when it comes to colour and pattern, while architectural forms influence our shapes. Our identity is deeply connected to our sense of place. The A of our logo comes from the old Irish A on the Arran Street East street sign, and the pattern and colour of our market area home is a big influence on how we design and make, with our first colour collection, Markets, inspired by the colour of the fruits and vegetables for sale in the market. It’s an area of Dublin that, we believe, is worthy of more attention, and we hope that by being here, we can help to attract more people to this part of town. - Each piece takes a week to handcraft from start to finish so it is a lengthy process. How has the business grown over time and how many people are now involved? We’ve been in existence for just under four years, and we now have 11 on the team, four full-time and the rest part time. So that quite a lot of growth in a short time, and much of it happened in the past year. - What have been the biggest obstacles to overcome in your business? Scalability: something that inextricably connected to growth. It’s definitely a challenge to scale a handmade, artisan process, but we’re working on it. - You have grown into giving courses and a partnership with Appassionata flowers. What is next for Arran Street East? We have just launched new our new colour collection, Cityscape, inspired by the skyline and materials that make Dublin. We have a new workshop series that has just started: Simple Food for Fast Times, with Aoife McElwain, in addition to our ongoing throwing workshops. We also just added a smallest water jug to our family of pitchers - at only 0.75 litre this cute addition proves to be very popular amongst our customers. We are revising our packaging and expanding list of international clients to ensure our pots reach everyone who loves them. We’re planning an exciting new addition: ceramic jewellery. Lots to do! 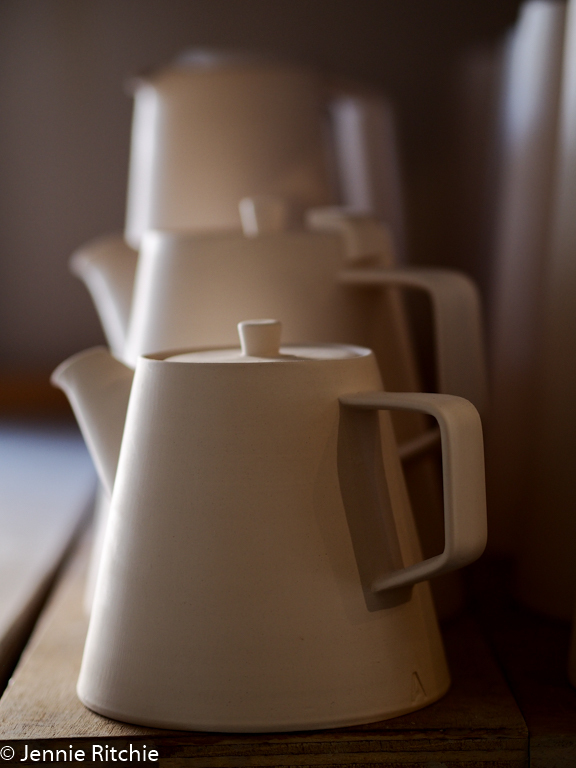 - From a personal point of view, is your own home styled in a similar aesthetic to your pots? Pretty much (only not as tidy!). - When you want to escape from Dublin city where do you like to go? - Do you have a favourite brunch spot in Dublin? Thank you to Laura, Dobrawa, Karl, Andrew & Patrick for sharing your time and energy!